Glow-in-the-dark transparent plastic beads in assorted colors. These "rings" make perfect glowing accents and resemble Life Savers. Mix with popular UV beads for day and night glow fun. All beads are made from high-quality plastic and proudly made in the USA. 14mm diameter with 3.5mm holes for easy stringing. 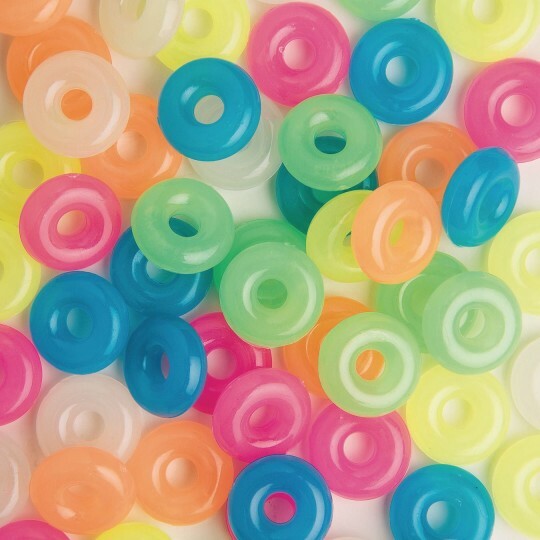 Glow-in-the-dark transparent plastic beads in assorted colors. These "rings" make perfect glowing accents and resemble Life Savers. Mix with popular UV beads for day and night glow fun! All beads are made from high-quality plastic and proudly made in the USA. 14mm diameter with 3.5mm holes for easy stringing. Approx. 360 per 1/2-lb. bag. Great spacer/holder for Key rings. Disappointing but the pony beads we used at the same activity did work. Phew!! Merchant response: Thank you for the recent product review you submitted. Our customer's feedback on their experiences with our products is vital and it helps us to identify problems. Your comments have been forwarded to the product team for review. Made Lifesaver bracelets in VBS. Kids LOVED them!